Presented in a beguiling storybook-like art style, Ivy The Kiwi? utilizes a unique control scheme to guide Ivy through her daunting journey. 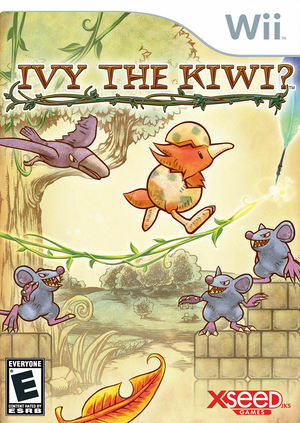 Ivy moves back and forth freely and independently of the player through timed 2-D side-view landscapes, and is guided by the use of vines created and controlled by the Wii Remote as players aim to collect more orange feathers through the stages to boost their overall score. These stretchy vines herd Ivy forward, upstairs, over walls and dangerous spikes and other menacing obstacles. Multiple vines may be created and used in conjunction, and an existing vine can be pulled in a slingshot motion to propel flightless Ivy skyward or forward as a projectile to drill through barriers and enemies. Vines bend and flex with the motion of the Wii Remote, but pulled too far and they snap! The graph below charts the compatibility with Ivy the Kiwi? since Dolphin's 2.0 release, listing revisions only where a compatibility change occurred. This page was last edited on 16 January 2018, at 23:15.